Resolution of the government’s alleged forced disappearances of its opponents before reform is not about concluding a bitter chapter of history — but about ensuring a just and humane future, say activists. “It’s about how the future Indonesia will be and where it will go,” said Yetti, an activist with the Indonesian Association of Families of the Disappeared (IKOHI). Yetti’s politically active father, Bachtiar, was allegedly abducted and shot dead by soldiers along with other activists in Tanjung Priok in 1984 during president Soeharto’s regime. Forced disappearances have emerged as an issue several times, such as in the 1997 election and in a 1998 plenary meeting at the People’s Consultative Assembly (MPR). 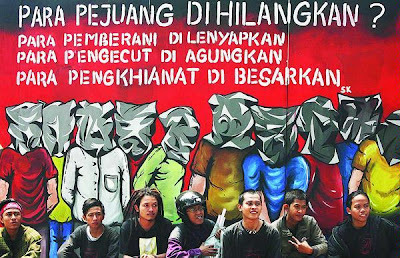 The House of Representatives (DPR) issued four recommendations in 2009, after the release of the National Human Rights Commission’s (Komnas HAM) report on the forced disappearances of 13 activists and ordinary citizens during the tumultous years of 1997 and 1998. The President, to whom the recommendations were directed, has yet to enact the recommendations. The House proposed forming an ad hoc human rights court, discovering the whereabouts of the 13 people, rehabilitating and compensating the families of the disappeared and starting ratification of the International Convention on Forced Disappearances. “If those four recommendations were followed through by the government, then Indonesia could probably experience true freedom and prove its genuine concern, which is what we have always hoped for,” Yetti said. Another IKOHI activist, Mugiyanto, said that families had problems because of their disappeared relatives ambiguous legal status. Families of the disappeared hold neither death certificates nor proof that they live, he said. Providing a formal status determination will allow families to claim rehabilitation, compensation and repatriation if the government follows the House’s recommendations, he added. “One of the most brutal consequences of forced disappearances is that it transforms human existence into non-existence,” he said. “This is what makes forced disappearances a perfect crime in the context of a court of law, since the person can’t be present,” Mugiyanto added. Mugiyanto said that families must receive certainty on the true status of the disappeared to give them a sense of peace. “These families have a right to know the truth and it is the state’s responsibility to provide the truth on whatever their condition may be,” he said. He added that similar incidents would continue to happen if no punitive action were taken against previous ones.